About 18% of Australia’s mangrove forest areas fall under the protection of National Parks and other reserves. Worlwide, about 35% of mangrove area was lost during the last several decades of the twentieth century (in countries for which sufficient data exist), which accounted for about half of the area of mangroves. Around the worl local action to save mangroves from development are becoming more common as the benefits of mangroves become more widely known. 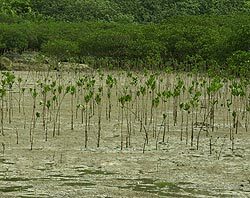 In some areas, mangrove reforestation is also underway. In 1971, a convention to protect "Wetlands of International Importance" was adopted in the Iranian city of Ramsar. To become a signatory to the Ramsar Convention, a country had to designate at least one such site and guarantee its protection. Around 110 countries have become signatories to the treaty. Some 850 "Ramsar sites" have been designated by these countries covering over 53 million hectares. About a third of these contain mangroves. In Australia each state has its own policies and legislation to protect mangroves, however, Australia has lost 14 per cent of its mangroves up to 2001.
report activities harming mangroves by contacting your nearest NSW DPI Fisheries Office or Fishers Watch Hotline on 1800 043 536. 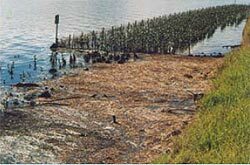 Plastic mesh fencing can protect mangrove rehabilitation areas from smothering by floating debris.